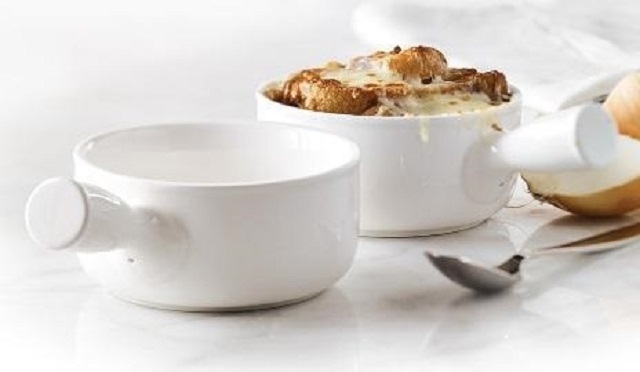 This recall involves 27 ounce onion soup bowls sold in pairs with identified SKU number 10557793. The soup bowl handle can break, posing a burn hazard to users or bystanders. As of March 15, 2019, the company has received one report of a handle breaking when removing the bowl from the oven in Canada, and no injuries have been reported. Approximately 5,609 units of the affected products were sold in Canada. The recalled products were sold from August 2018 to January 2019 in Stokes and Think Kitchen stores. Chaozhou Yangguang Ceramics Co. Ltd.
Consumers should immediately stop using the recalled bowls and return the product to the place of purchase for a full refund. For more information, consumers may contact the company's customer service by telephone toll-free at 1-888-786-5375 from 9:00 a.m. to 5:00 p.m. ET, Monday through Friday, or by email.